The 30th edition of the Harbin International Ice and Snow Sculpture Festival officially opened last Sunday in Harbin, China. Around ten thousands sculptors worked for two weeks in order to complete the majestic ice sculptures, which reproduce a whole town and create a magical atmosphere thanks to special LED lighting effects. Using 180.000 m2 of ice and 150.000 m2 of snow, the talented craftsmen realized the huge sculptures reproducing, amongst others, the Coliseum and Roman and Asian temples. 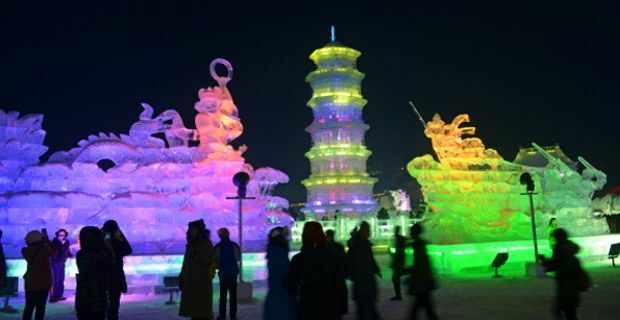 If you are wondering where all that ice and snow came from, consider where the festival is located: known as the coldest city of China, Harbin is in the Heilongjiang province, a freezing corner of northeast China, near the border with Siberia. Tireless workers stabbed iron pikes into the frozen Songhua River for weeks ahead in order to extract the giant ice cubes required for the sculptures. As for the snow, it is reportedly man-made. The incredible results of such labour cover an area of 6.5 million square foot, a jaw-dropping landscape of iconic buildings from every corner of the world, larger than life replicas of snow maidens and famous sculptures or sculptural complexes. Some of these, fancifully lit at night by state of the art LED technology, transform into a visionary experience that is surely worth the trip and the endurance of the extreme cold temperature. The Harbin festival, which will run until the end of February, is expected to attract 10 million visitors, Chinese and foreign alike. If you really can't make it, enjoy the next best thing to seeing it live: our fantastic photo gallery of some of the most amazing pictures of the 30th edition of the Harbin International Ice and Snow Sculpture Festival.